Human rights are thought to guarantee pluralism by protecting individual liberty from imposed religious conceptions of virtue. Yet critics often argue that this secular focus on merely avoiding violations can also enable unfettered individualism and undermine appeals to the common good. This book uncovers in secular rights pioneer Hugo Grotius a rights theory that points toward the enlargement of individual responsibility. It grounds this connection in Grotius’ unexplored theological corpus, which reveals a dual metaethics and jurisprudence. Here a deontological natural law undergirds a secular theory of rights that is self-aware of its own limitations. A teleological practical reason then guides the exercise of these rights, so as not to compromise the political order that defends them. The book then illustrates this symbiosis of rights and responsibilities in five areas: consent theories of government, rights of rebellion, criminal punishment, war and international responsibility, and Atonement theology. 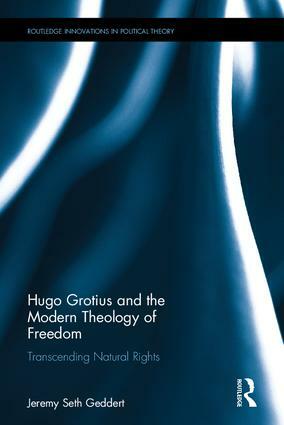 This reassesses Grotius’ legacy as a secularist opponent of classical political thought, and suggests that modern liberalism and universal human rights are compatible with a world of resurgent religion. 4. The Origins of the State: How and Why? Jeremy Seth Geddert is Assistant Professor of Political Science at Assumption College. He has published on natural rights, early modern political thought, religion and politics, and the just war tradition.